WOMADelaide is an annual world music and dance festival, which was first held in 1992 in Botanic Park, Adelaide, South Australia as part of the WOMAD series of music festivals. WOMAD events are a showcase of a variety of colourful and diverse types of music, arts and dance. They encourage people to experience the music of cultures other than their own as a way of developing global understanding. 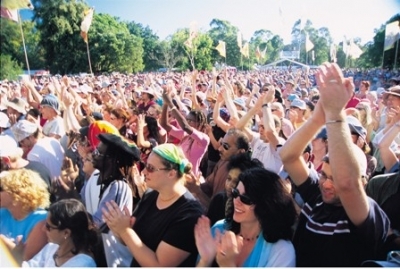 The WOMADelaide festival aims to entertain all age groups and people from all backgrounds. This event is a must see for everyone wanting to expand their horizons and get a glimpse of some of the world's most exciting music, dances and cultures right here in Adelaide. WOMADelaide 2011 will be held from Friday 11 - Monday 14 March outdoors in Adelaide's beautiful Botanic Park. Organisers draw performing artists from all over the world. A specific emphasis is placed on traditional music and performances of various cultures although some more contemporary, popular acts are included. Artists also lead workshops demonstrating and/or discussing aspects of their performances on smaller stages. So don't miss this great chance to get up close and personal with some great local and international performers. BookToday has a wide range of WOMADelaide accommodation options. Come and be a part of the musical energy taking Adelaide by storm. We have the best accommodation deals for your stay in Adelaide. If you require further assistance with your booking, please call 1300 733 274 and speak with one of our friendly customer service assistants.